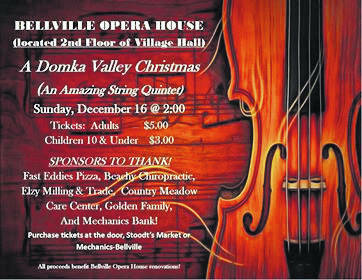 BELLVILLE — The Village of Bellville is hosting A Domka Valley Christmas at the Bellville Opera House on Sunday, Dec. 16 at 2 p.m. Because we have six generous sponsors all proceeds go toward renovations in the Opera House. A Domka Valley Christmas is a performance by an amazing string quartet. Tickets are on sale now at Stoodt’s Market and Mechanics Bank. They are $5 for adults and $3 for children 10 and younger. Sponsors are Fast Eddies Pizza, Beachy Chiropractic, Elzy Milling and Trade, Country Meadow Care Center, Golden Family and Mechanics Bank. The Bellville Opera House is on the second floor of Village Hall. Tickets also will be available at the door on Dec. 16.